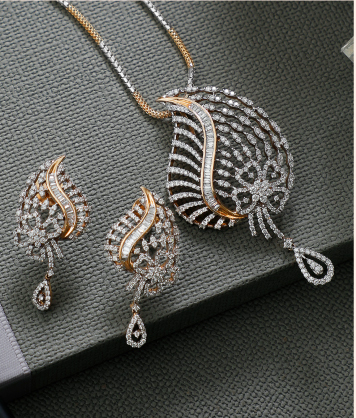 Ornate Diamond Jewellery Collection is all about imperial motifs and ornate designs crafted to honour the royalty in every woman. 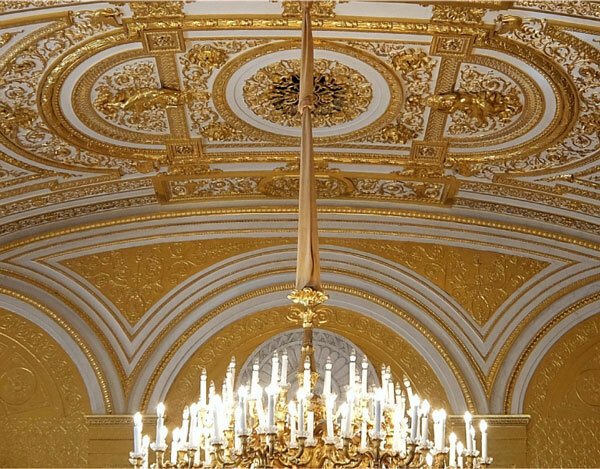 The jewellery collections draw inspirations from the designs of the Victorian era, with extravagant motifs in brilliant round diamonds. 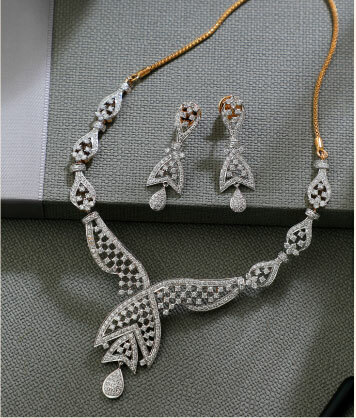 Baguette diamonds set in paisley motif pendant sets to art-deco inspired diamond necklaces and latticed diamond bangles, the Ornate diamond collection is one of our coveted diamond jewellery masterpieces. 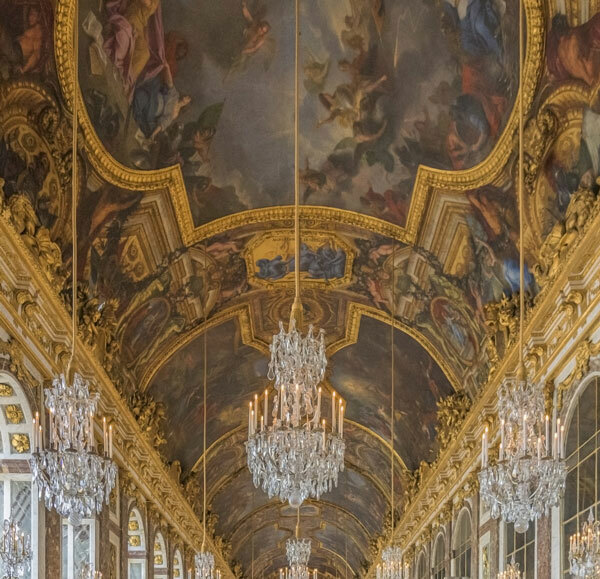 The Ornate collection has designs which borrow from the intricate lace work of vintage evening gowns and floral, scalloped collars of Victorian era. The whole collection reflects a quaint charm and adds a modern touch to your dinner evenings and classy soirees. An elegant diamond necklace inspired from the art-deco era, this jewellery masterpiece is studded with VVS EF quality round diamonds in 18K yellow gold. 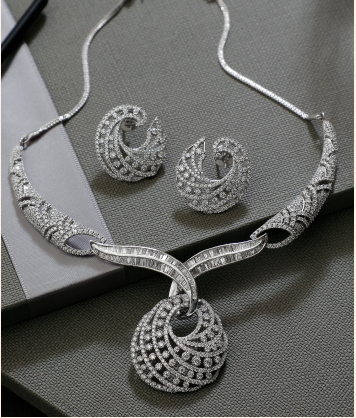 With 4.83 carat diamond weight, it is a classic diamond neckpiece to adorn. A classic floral concept diamond necklace in 18K yellow gold. 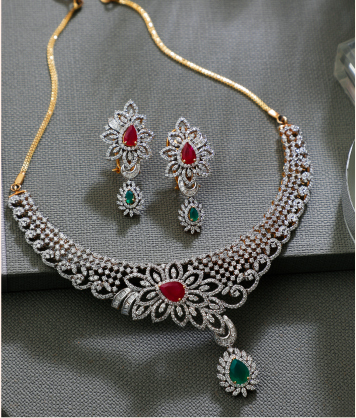 This shimmering diamond necklace is studded with beautiful coloured gemstones and VVS FG diamonds and has a total of 10.55 carat in the whole diamond set. 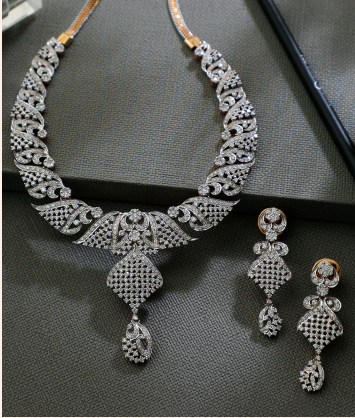 A diamond necklace that fuses two design concepts into one! Crafted in 18K white gold, this diamond necklace is studded with baguette diamonds in intersecting wings and criss-cross ornate pattern of round diamonds with VVS FG diamond quality and 6.110 carat diamonds. The grace of the Victorian era and gleam of round diamonds come together in this twinkling diamond necklace crafted in 18K white and yellow gold. 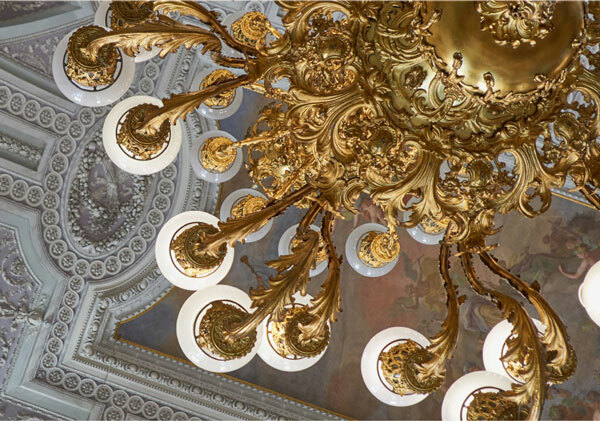 The swirling ornate patterns have VVS FG quality diamonds in a prong setting with 11.83 carat diamonds. 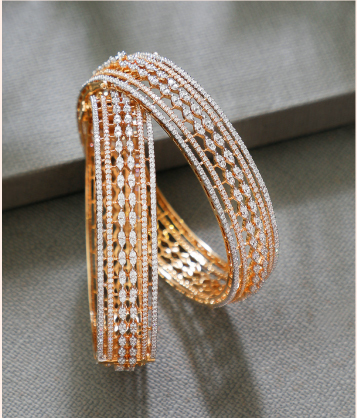 Diamond Bangles that define charm! 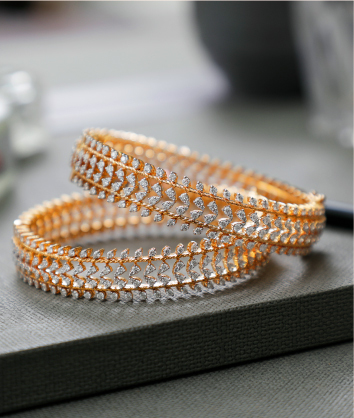 Crafted in 18k yellow gold these beautiful bangles are designed with an intricate lace pattern and studded with VVS FG quality round diamonds having a weight of 12.45 carats. 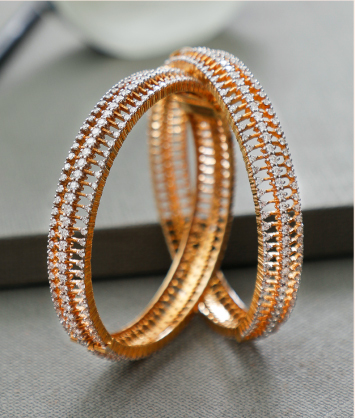 Diamond bangles are classic must haves of your jewellery trousseau! 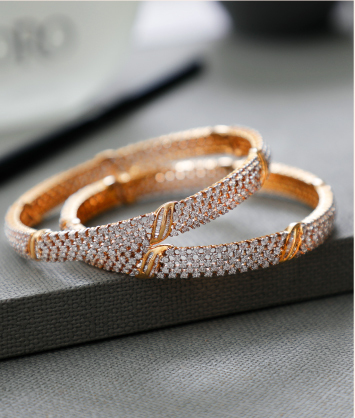 Like this minimalistic ornate patterned pair of diamond bangles crafted in 18K yellow gold studded in VVS FG quality diamonds with a diamond weight of 10.22 carats. 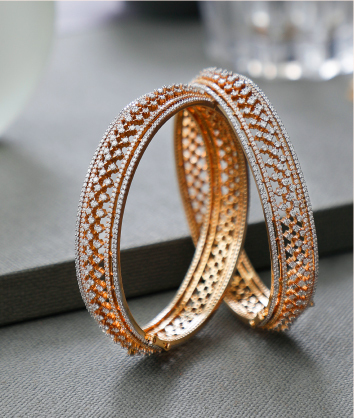 Ornate Latticed Diamond Bangles! Dainty white round diamonds in VVS FG quality are studded in 18K yellow gold in these classic beauties. Inspired by the Victorian palace windows and its intricate architecture, these diamond bangles come in VVS FG quality round diamonds and dainty baguette diamonds in the arc of each gold breaker. 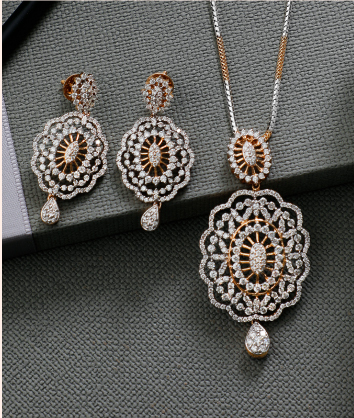 An elegant diamond pendant set crafted in a ‘jaali’ pattern with VS GH quality of round diamonds in 18K yellow gold with a prong setting. 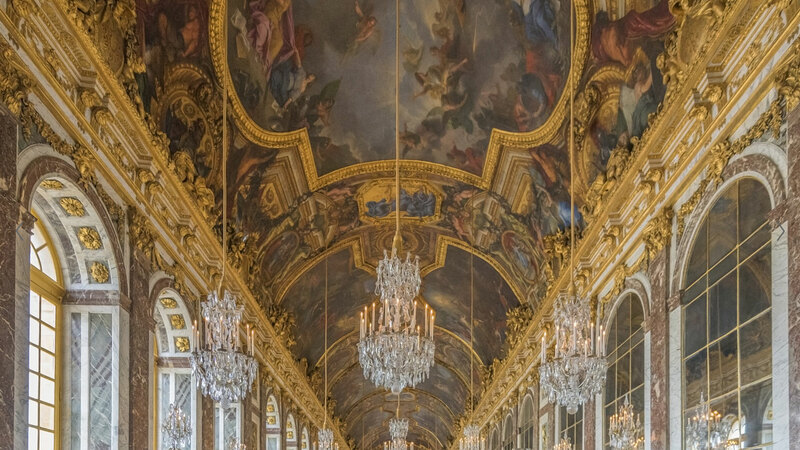 The whole diamond pendant set has a total diamond weight of 5.2 carats. A beautiful paisley pendant with shimmering ornate patterns in 18K yellow gold with VVS FG diamond quality & 3.70 carat diamonds. 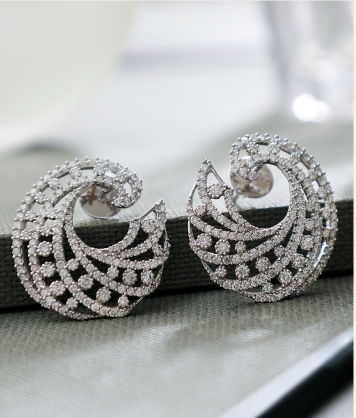 Dainty Diamonds sit pretty on the swirling lace outlines in these classic diamond stud earrings Crafted in 18K white gold and VVS FG diamond quality, these diamond earrings are your best friend on those dinner dates!